Diggers Valley: 29 September 2007. The week beginning the 29th of September 2007. 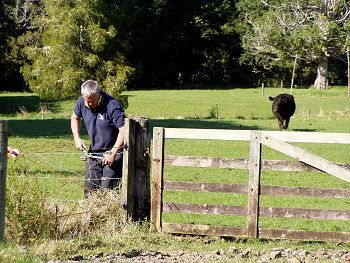 Stephan rearranged some electric fence switching this morning so we can have the bottom wires of the fence around our house turned off at the same time as those of the lane and the rest of the House Paddock. There was also a significant area around the bottom of the flats which hadn't been included in the bottom-wires-off system and now is. 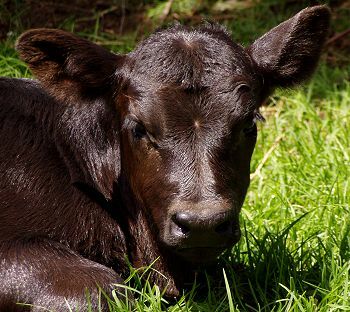 When the calves are very new, my life is made easier when the calves aren't subject to shocks when they blunder into or through the fences. That's Ivy in the background, obviously hoping someone's going to give her some feed-nuts. A few weeks ago I enquired at one of the farm supplies stores about trough dispensing systems for Magnesium. I had thought I'd get a couple of dispensers for each of the flats paddocks I intend to use for calving (there are two troughs in most of them) and move them around as required. But when I discovered that each dispenser would cost me the thick end of $200, I decided I'd rethink that plan. Topmilk having closed, we've been able to acquire a number of blue bins, which make wonderful cow-feed dispensers. There are as many bins as cows in each paddock and I am mixing enough Magnesium Oxide powder as is necessary for that number of cows into molasses, then taking it out to them daily. 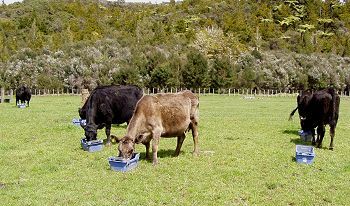 It's probably as reliable a system as putting the Magnesium in the water supply, in that most of the cows learn to like molasses very quickly and will eagerly lick up their portion. It may cost slightly more in the long term, but has the advantage of giving the cows a bit of a sugar hit with the molasses, which, this wet cold spring in particular, is probably a good thing. Feeding them is also a very good method of quietening jumpy cattle (not that there are too many of them left in the herd); two-year-old 517, whose picture is at the bottom of this page, has been running away from me up on the hill for the last few weeks but with daily molasses and Magnesium has settled down markedly. Ingrette can't walk, but she can run! I discovered it was a lot easier for her to move along if I held onto the base of her tail, rather than her left hip - and a bit easier on my back as well. I am of course being careful not to take too much weight on her tail for fear of damaging it. On my way back from reorganising some of the cows, I said hello to Yvette. From the house I looked back, just after I'd poured a cup of tea, and there she was, cast. I decided she could jolly well wait where she was until I'd had my drink, and I'd then go and set her aright. To my mild horror when I returned to her, I discovered she was actually in labour, with a couple of fluid-filled bags and blood at her rear. I helped her up and left her to it while I walked quietly back for the bottles of lubricant and iodine, and to wash my hands and arms. I thought perhaps it might be best to check if she needed some assistance, since I'd left her struggling in such an awkward position. 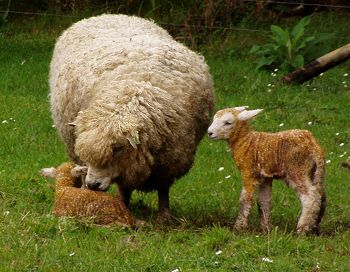 Her two lambs are both rams. The first one was presenting only one leg and his head. I pulled him out as he was, without too much difficulty, then fished the other one out as well while I was there. They seem fine, except both have entropian, the condition where the lower eyelids are turned inwards, so that the hairy lid irritates the cornea. Often the lid can be flicked out and that will fix the problem, but in many cases it takes several attempts before the lid stays where it should. 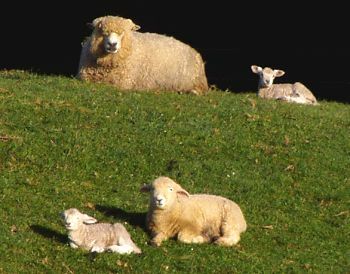 One of the larger lamb's eyes is quite clouded where the lid has irritated it before birth. I'll have to check these again over the next few days. NZ daylight saving time has been moved forward by a week this year. As is usual on this first day of the one-hour shift, I feel quite disoriented as I try and reset my own time-awareness to the new clock time. 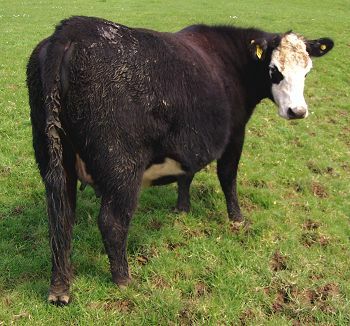 Onix's daughter, 456, produced a heifer overnight. 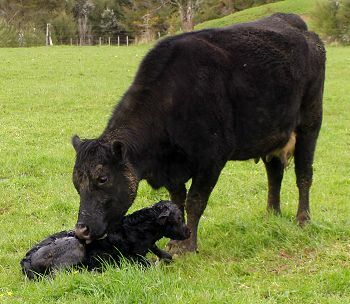 The calf's sire was #26 and I was there at her conception on New Year's day, wondering if 456 would survive the bull's amorous attentions while they were both in a river crossing! Just after 1pm 479 produced a heifer calf, with a great deal of noise during one part of her delivery. Another #26 daughter. 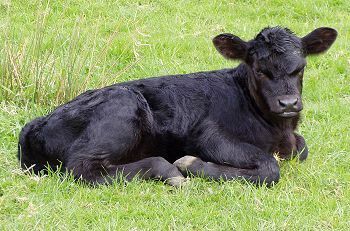 Somebody's cute calf, probably 479's. Three-year-old 475 wandered around the paddock like this for a couple of hours this morning, eventually getting on with more obvious labour, during which she popped out a couple of feet and a bit of calf tongue. Then she wandered around for another hour or so, before settling down to produce her calf - I remembered that she did very much the same thing last year. 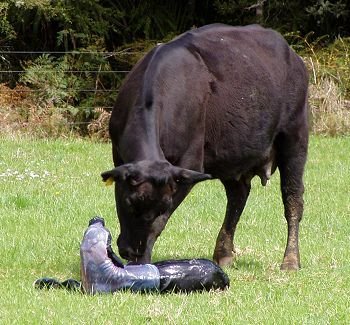 Sometimes watching calvings can take an awfully long time! 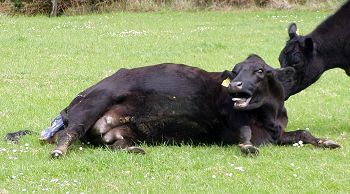 This alarming face is something I see occasionally in some of the cows: not accompanied by any noise, it's a very stressed look, panting with the tongue hanging out. She was actually between contractions at the time. I sat under a nearby Puriri tree and watched, until she delivered her calf, still partly covered by this very attractive veil of membrane. Another heifer for #26. 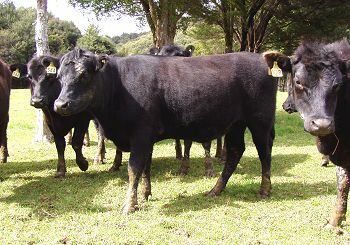 It's nice to have heifer calves from these very nice three-year-old heifers which produced such good steer calves last year - both 479 and 475 had bull calves to an insemination sire - and I shall look forward to the possibility of keeping their daughters this year should they prove, as I expect they will, as good as their first sons. 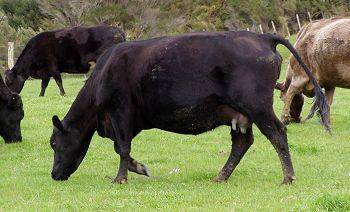 Half an hour after the calf was born, 475 walked her up the paddock to join the rest of the mob. Some of them are astonishingly quick to get going. Ingrette in her coat, standing outside the back of the house where there's some nice grass for her to nibble on, and she's near enough for me to walk out and stand her up regularly. 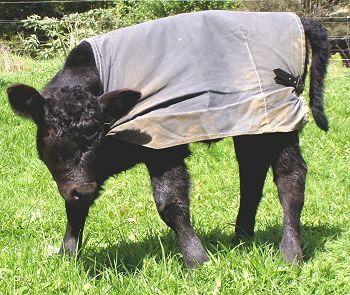 The coat is usually only on overnight, or when it's raining during the day, for fear of her over-heating. I was walking out to check on the young heifers this morning and there was a strange little noise from down in the river bed as I approached their paddock. It sounded like some sort of animal was down there moving around on the stones, but I couldn't see anything from above. 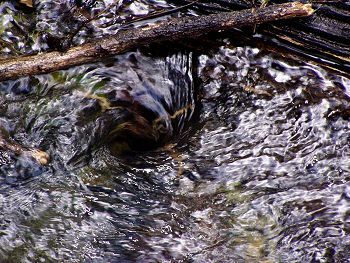 When I went around and down to the stream, I discovered it was the slurping down-the-plughole noise of the water going through a small gap underneath some wood. I like this little heifer. 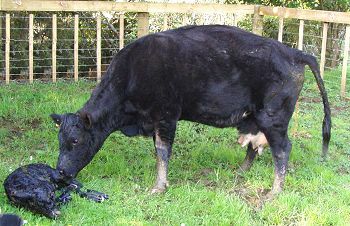 She is 544, the daughter of 488 who was a two-year-old at calving last year and she began life as a tiny wee thing, weighing only 25kg. From small beginnings she has kept up a respectable growth-rate and is holding her own with the best of her contemporaries. What a difference a month makes. That's Yvette sitting up on the hill with one of her lambs behind her and the other sitting with Babbette's lamb, which was born about a month ago. To the other lambs these little guys are half-brothers and uncles, since their sire is Yvette's son from last year. Yvette is her sons' mother and grandmother. It's confusing, but they'll make very good roasts, when the time comes. 371, on the right, was looking uncomfortable at 9am and I continued to watch her with interest during the day, wondering when she'd start her labour. 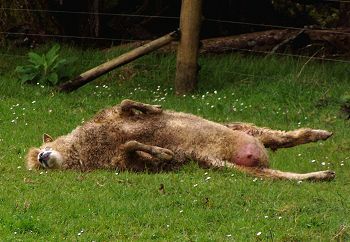 At around 3pm she was obviously in labour, but things weren't looking quite right: she would lie down, but nothing happened. Usually there'll be a membrane bag and soon after some feet and it generally doesn't take too much time in a cow which has been through the whole process before - this is 371's fourth calving. She wasn't at all happy about being forced to leave her chosen calving spot, but I insisted, taking her full sister, white-faced 416 with her (they're both daughters of 46 and Bertrand). Stephan joined me at the yards and we put her up in the race and I donned a long glove, added some lube and went in for a feel to find out what was going on. 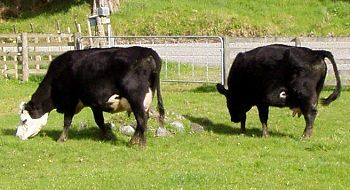 If you imagine the back of the cow as a clock-face, there were two front feet, but they were upside-down at 11 o'clock and the head was also upside-down and around at 5 o'clock. 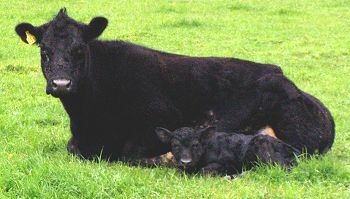 Usually a calf will present as if it is about to dive out feet first, with the head above and just back from the lowest leg joints. 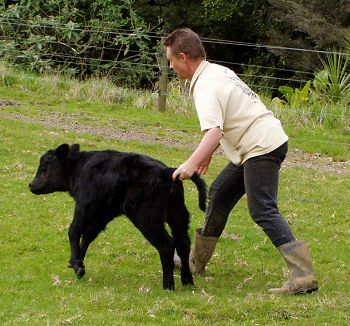 I couldn't work out how to get the calf around into the right position, since we still don't have any gear for pulling calves, so went home and phoned the vet. Nathan came out, put calving chains on both legs and another around the back of the head and through the calf's mouth (the best way to make sure the head comes out in a straight line with the feet) and he and Stephan pulled. She was, like most of #26's calves, a nicely streamlined little heifer which hit the concrete rather harder than I was pleased with, but was, within half an hour or so, up on her feet and all was well. Before we let her out, Nathan gave 371 a prophylactic antibiotic injection, since he'd been messing around inside her rather a lot, with both hands and chains. 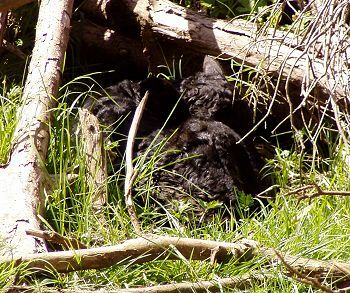 Calves can hide so very well, it's sometimes rather hard to find them. 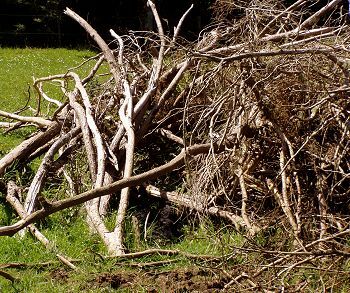 371 had walked her calf up to the paddock by early this morning and this afternoon she was tucked away in the bottom of this pile of tree-prunings where I took some time to spot her. It's hard to keep track of who's who before the calves are tagged, so I don't actually know who this is, but she's very pretty. I'm still waiting for the first of the two-year-old heifers to calve, but I'm fairly confident about their condition - this is 517, who's nicely covered, with a low-birthweight calf inside her. She's in her due period now and by my calculations she is likely to calve tomorrow, although she doesn't quite look ready to go.